Kwok Pui-lan is internationally known for her postcolonial and Asian feminist approaches to theology and biblical studies. Influenced by post-structuralism, postcolonial theories, and feminist criticism, Kwok’s theological investigations cover diverse academic disciplines, including classical systematic theology, biblical studies, and feminist and postcolonial theories. Although her academic concern deals with quite a wide range of issues, all of her works focus on creating a dialogical and diasporic space in which women from different ethnic, religious, cultural, and geographical backgrounds can work together in order to “challenge our own biases and investment in a particular interpretive method,” so that they can transform the space into “places of mutual learning, and places for trying out new ideas and strategies for emancipation of all” (99). Postcolonial imagination is one of the most significant concepts by which one can comprehend the dialogical/diasporic space. According to Kwok, “To imagine means to discern that something is not fitting, to search for new images, and to arrive at new patterns of meaning and interpretation” (30). What, then, is postcolonial imagination? The first part of this volume, “Postcolonial Imagination and Feminist Interpretation,” which comprises four sub-chapters, discusses the detailed concept of her postcolonial imagination and its implications. Kwok proposes three imaginations as a postcolonial imagination. First, historical imagination is a process of recovering and reconstructing women’s subjectivity in writing and interpreting history not only in the past but also in the present and the future. Second, dialogical imagination is a process of formulating creative hermeneutics by connecting the disparate elements from different Asian people into a meaningful whole (38). The third and the most important postcolonial imagination is diasporic imagination. Kwok argues that diasporic discourse has become a power to challenge the construction of the “center” and “periphery” since the term “diaspora” implies a blur between “home” and the “world,” dislocation of identity, and hybridization of culture in a colonial contact zone (45-46). Additionally, diasporic discourse can “decenter and decompose the ubiquitous logic and ‘common sense’ that says that the cultural form and norm of Christianity is defined by the West” (48). As a discourse, diasporic imagination connotes a resisting power against universalism and a colonial mode of thinking (49). Hence, Kwok’s diasporic imagination is an effort to recognize the diversity in the globalized society; moreover, it can have its influencing power as encouraging mutual respect among those who have different historical and cultural backgrounds. 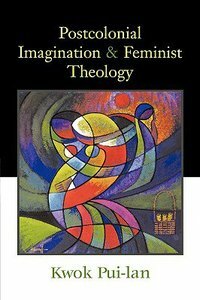 Kwok also examines sources that postcolonial feminists can utilize such as experience, Scripture, tradition, and reason (chapter 2), and she demonstrates how the concept of postcolonial imagination works in one’s practical engagement with the Bible (chapters 3 and 4). The second part of this book, “Postcolonial Feminist Theological Vision” (chapters 5-9), pays special attention to the connection between postcolonial studies and feminist biblical interpretation. Kwok points out that a non-white female scholar is inherently engaged with both postcolonialism and feminism. Since postcolonial criticism and feminist criticism share common concerns and insights and can benefit each other, “The most important contribution of postcolonial feminist theology will be to reconceptualize the relation of theology and empire through the multiple lenses of gender, race, class, sexuality, religion, and so forth” (144). Following this vision, Kwok discusses various issues including the relationship between theological symbols and empire, interreligious dialogues, environmental degradation and its impact on the lives of marginalized women, and the symbolizing of women and deployment of gender in the biblical texts. Her work, as a whole, is an intercultural approach, and Postcolonial Imagination and Feminist Theology demonstrates well how Kwok has brought together feminist theological discourses from different cultural contexts (21). Some might critique Kwok’s work because she uses Western epistemology and theology as a critical paradigm for her investigation in some discussions and her studies seem to be related to her academic interests rather than practical situations. Nevertheless, this volume is invaluable as it presents a vision that women from diverse backgrounds and experiences can share their stories and construct a new image of God, the world, and human community.